Errors in clinical reasoning are central factors in many diagnostic errors. 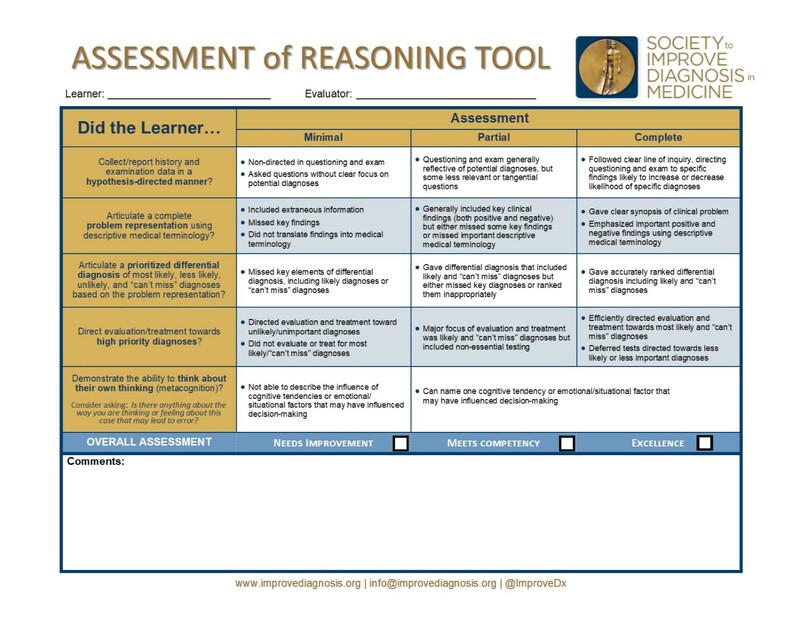 The Society to Improve Diagnosis in Medicine (SIDM) has developed the Assessment of Reasoning Tool (PDF) to support educators in assessing a learner’s clinical reasoning skills during patient presentations. For those working in medical education, assessment of clinical reasoning skills is essential as we train the next generation of physicians. The Assessment of Reasoning Tool is a practical resource to support you in evaluating your trainee’s clinical reasoning skills. A series of educational videos will help you understand the process. The Assessment of Reasoning Tool will guide your feedback conversation with your learner and serve as formative feedback. The tool can also help programs fulfill LCME and ACGME requirements for assessing diagnostic and clinical reasoning skills.